Jamie Annette Dantzscher (b. May 2, 1982, Canoga Park, California, USA) is a retired American gymnast. She was a member of the fourth-place US team at the 2000 Olympics in Sydney. Training at Charter Oak Gliders club in southern California, Dantzscher was a member of the US national gymnastics team for eight years, starting in 1994. In her international debut, the 1996 City of Popes competition in France, she won the all-around and the floor exercise titles. 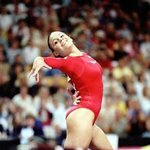 Danztscher competed in her first senior US Nationals in 1997, placing sixth in the all-around. Her placement would have qualified her to the US squad for the 1997 World Artistic Gymnastics Championships, however, at age fifteen she was still too young to meet the FIG's newly-raised minimum age requirement. 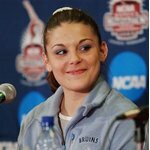 She did represent the U.S. at the 1999 World Gymnastics Championships, where she placed sixth with the American team. 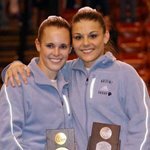 In 2000, Danztscher won her first US Nationals all-around medal, a bronze. She placed fifth at the Olympic Trials, securing a berth in the U.S. Olympic team. 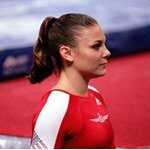 Although Dantzscher fell on the floor exercise during the team preliminaries in Sydney, she competed well in the team finals, contributing a valuable 9.700 on the uneven bars and a 9.712 on the floor exercise. Dantzscher was one of the most visible members of the US Olympic team in the media, due to her outspoken opposition of then-National Team Coordinator Béla Károlyi's policies. Her opinions about Károlyi, which were corroborated by many of her teammates and their coaches, were published in many major news outlets during the Olympics. After the Olympics, Dantzscher joined the UCLA Bruins gymnastics team. During her NCAA career she achieved 28 perfect 10.0 scores setting a school record that has yet to be overturned. In her first meet as a Bruin, she scored perfect tens on both of the events she competed: floor and bars. 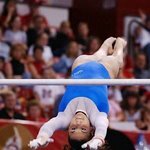 It is believed that she is the first gymnast in NCAA history to score a perfect ten on her first-ever collegiate routine. 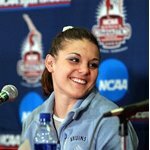 By the time she had finished her four years of NCAA competition, Dantzscher had achieved All-American honors fifteen times, earned three Pac-10 individual titles and been a part of three NCAA Championships first-place teams with the Bruins. She was awarded the 2004 AAI American Award. Jamie comes from a family of 7 children, many of whom have also participated in gymnastics. Both of her parents and all of her siblings have first names beginning with the letter "J." Her younger sisters Jalynne and Janelle currently compete on the UCLA gymnastics team.